Pesto is a very versatile, healthy dressing/sauce that is wonderful on pizza, sandwiches, wraps, vegetables, and of course, pasta. I love to make it fresh with basil from my garden, but since my plants just went in, I opted for the store bought version to make this dish. Cook pasta according to package directions, drain and set aside to cool. Do not rinse. Prepare broccoli and tomatoes and finely grate cheese in a mini food processor. In a large mixing bowl, combine pasta with pesto and yogurt. Add vegetables and toss. Add parmesan and toss again. Deep South Magazine is searching for some great summer salad recipes to post on our site this month. 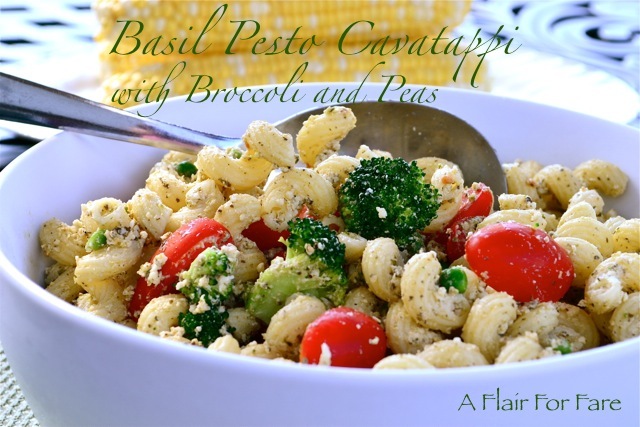 I was wondering if you might allow us to repost your Basil Pesto Cavatappi with Broccoli and Peas salad with a photo. We would credit you for the recipe and link back to your site. I look forward to hearing from you! Hi Lindsey, I am definitely interested. I sent you a reply via email. Thanks for contacting me!